WEFUNK and funky music makes me feel good just like eddie fisher says. LOVE EVERYTHING 'bout WEFUNK!!! U rock my world, tnx!!!! Biggup from Serbia!!!!!! I just love that music! listening to it right now! i love the way you twist things up with the funky styles, and then put on something from nas... keep it up! Hi, I'm from Serbia. The Show is great. Keep rollin'. Who's the Karma Atchyka. that song Wintertime is not bad at all. if ever you will come over to europe be more than welcome. Thanks for delivering the slammin' funky grooves! Big thanks for the stereo torrent versions (i'll keep it seeding). WeFunk in stereo - it's a whole new world! Cookin' in Austin, TX. 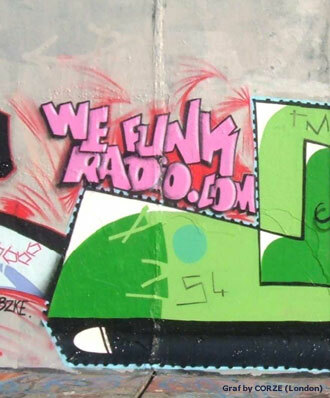 Wefunk continues to blur the lines between funk & hip hop. Keep it coming! Good show! Staying linked to your website! THX Prof Groove!!! Keep up the good work! DJs & GUESTS DJ Static, Professor Groove / RECORDED July 8, 2005 / PLAYLIST MARKING sirbaihu / HOSTING daduke, PJ, Mike & Oliver. You can help too!